Preparing your body properly for training and competition is important to ensure you perform to your potential and to reduce the risk of injuries. But it’s also a valuable time to work on new aspects of training or maintain other fitness qualities if time is limited for your training. Now whilst getting on the treadmill, bike or rower for 10 minutes will no doubt serve the purpose of warming you up, you can make much better use of that time at the start of each session to improve fundamental areas of your fitness. The RAMP framework for me is great because it allows me to make the most out of the 10-15 minutes at the start of a session. Now 10-15 minutes doesn’t sound like a lot of time but when you do this every session, every week it accumulates to a lot of training time. The potentiation phase also provides a nice little window of opportunity to have the athlete doing some power & speed work in a strength phase or a bit of strength work in a power phase; or with younger athletes there some time available to develop technique for the Olympic Lifts. The combinations you can use are endless and can be tailored to the athletes individual needs and goals of the specific training phase. This movement preparation protocol is something I learnt from Ed Archer during my time working for him at the Athlete Academy. It was a system we used at the start of every training session with groups and individuals that has proven to be very effective for a number of reasons. When starting out with a new client/athlete/team this is usually the first thing I will do with them as it provides me with a lot of info and I can start to make decisions about what is an appropriate starting point for them. It serves as a good screening process as immediately it gives you an idea of their capabilities in terms of co-ordination, flexibility, stability & strength. From a coach’s perspective it ticks quite a lot of boxes the sequence contains movements through all three planes: sagittal, frontal & transverse so it’s providing a more varied stimulus than just getting people running/rowing/cycling at the start of a session. Our sports use movements in all three planes so let’s get the body moving through all of them from the start. It’s also providing a training stimulus for improving co-ordination, core strength, shoulder stability and single leg work. The basic movement preparation sequence requires no equipment and once you’ve got it down you’ll be through it in as little as 6 minutes. One thing I must emphasize is that although this can be done in 6 minutes, don’t rush it & always aim for technical perfection and then progress the speed you execute it. Quality movement is the priority. So those exercises cover the RAM of the RAMP – The ‘P’ I’ll take care of in another series of articles as depending on the training goal and the level of the athlete this will vary. Give it a go, and leave me a comment to let me know what you think. This is one of the most simple yet effective tools for coaching the correct position for acceleration and to begin getting strength gains made in the gym to transfer to actual movements. The focus should be on quality execution of single repetitions to begin with and then you can to progress to executing ‘doubles’ & ‘triples’ when you are able to maintain the technique. Start by using 2-3 sets of 8 single repetitions (4 on each leg) and take about 90-120 seconds between sets. I often use it at the end of a Movement Preparation sequence before heading into the main body of a session. As a coach one of the common things I hear when I’m talking to people about their strength training is that they’re banging away just trying to go heavier and heavier week on week. Training in this way may get you results up to a point, but you’re going to hit a plateau at some point. In addition, if you’re always lifting at a 100% repetition max (RM) load (i.e. that maximum load you can lift for a given number of reps) you are constantly subjecting your body to a high level of stress that will result in a lot of fatigue & may in the long term result in over training. The fact is you don’t have to max out every session to get stronger. A system I have used with a lot of clients/athletes over the years is a step loading system varying loads across a training cycle between 80-105% of a rep max load. 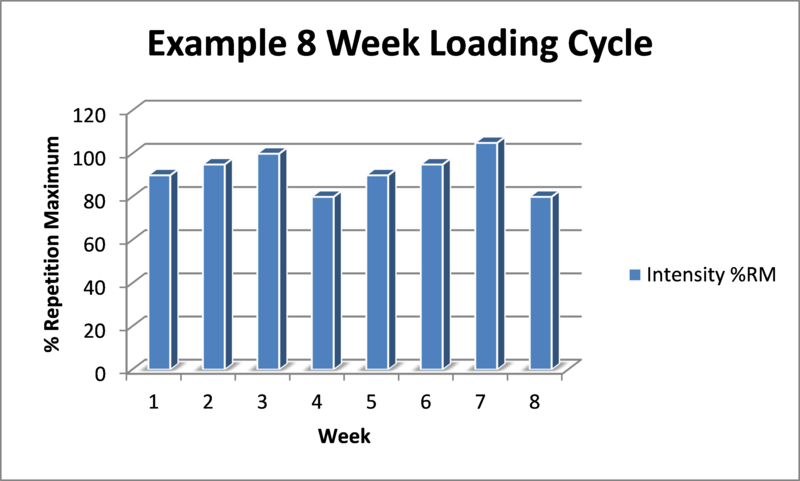 The loading pattern that has worked consistently for me is 80% – 90% – 95% – 105% then the pattern repeats itself. With this system you lift “very heavy” (105% RM) once every 4 weeks and that week is followed by a recovery week of 80% RM to allow for supercompensation (see previous article on recovery for an explanation of this process) because the unloading gives your body an opportunity to recover. The process then repeats itself building the loads back up over the next few weeks from 80-90-95% to another 105% load. Having completed week 4 with a new 5RM of 105kg the next 4 weeks % RM loads are calculated from this new PB. Now this certainly isn’t the only way to get strong and there are lots of variations to the sets, reps and variations to %RM that you can utilise, but this system has produced consistent strength gains for me as a coach and reported improvements in the athlete’s physical and mental freshness/preparedness for their training after the carefully planned recovery weeks. Having been working with junior athletes between the ages of 11-18 for the last few years one of the major areas that is a concern for me is what opportunity, if any, do they have to recover within their weekly schedule? Do parents, school teachers and club coaches have any idea of the total work the young athletes are completing in any given week? What are the implications of their training schedules to the athlete’s long term development and their health? Recovery is a process resulting in a return to baseline energy levels and then an optimal performance state. The diagram below (Figure 1.4 source: Zatsiorsky, 1995) is the theory of Supercompensation which is a four step process. The horizontal line is the athlete’s baseline level of fitness/preparedness. The vertical axis and curved line represents the changes in the athlete’s fitness/preparedness as a result of any workout. When any form of training or sport is completed by an athlete this stress is followed by a depletion of the body’s energy stores creating a state of fatigue demonstrated in the first section of figure 1.4. At the lowest point if the athlete were to attempt to perform in their sport there would be a predictable drop off in the level of their performance. When the athlete is given a suitable period of recovery which could be in the form of active rest, a recovery session or a light training session. The athlete’s energy levels and preparedness to perform will return to baseline levels. This is the body’s adaptive response to the fatigue brought about by the training and it is a rebound above and beyond the baseline levels creating a heightened state of energy levels and preparedness to perform. At this point if they athlete were to perform in their sport/training we would expect performance to be of a higher level than normal. From the peak of supercompensation there is a natural decline back to baseline levels if there is no new training stress applied, known as the detraining phenomenon. Athletes invariably train and compete according to a set schedule, and when careful consideration is not taken this schedule can be intense/excessive/challenging. Typically the athlete will follow this schedule regardless of the readiness of the athlete to train or perform. In such cases, athletes will not be at their optimum to train or compete due to insufficient recovery or poor adaptation to their training again as a result of little or no recovery time, or poor recovery strategies. Certainly the young athletes I have been in contact with appear to have little or no recovery planned in to their weekly/monthly schedules. The more gifted and talented the athlete it appears the more demands are placed on them as the school teachers and club coaches insist on their involvement in any and every game/sport going with little thought given to the benefit of the session to the individual and there appears to be little communication between any of the parties to ensure that the young athlete is not overtraining. From teachers that I have discussed this issue with they are aware of young players playing 3 games in a week including 2 in a weekend. I’m not pointing the finger of blame at any of the parties in the mix as they are all facing different challenges that make it unrealistic to plan to this extent for each individual athlete in the school or club. However, for that small percentage of young sports people who have shown signs of the capability or desire to compete at the highest level surely we must take the time to plan their training and competition schedule appropriately to avoid physical/mental burnout? Overtraining is the result of a long term imbalance between the amount of stress applied to the body through training and the individual’s ability to tolerate and recover from the training. Symptoms of overtraining aren’t always clear but residual fatigue, persistent minor injuries, loss of motivation and a lack of progress are some examples of the negative effect that it can have. Physical symptoms include reduced appetite, a tendency to tire easily during exercise, weight loss, a slight increase in blood pressure, an elevated resting heart rate. In an optimally planned training schedule another training session would take place at the peak of the supercompensation curve and the process would start again from step 1 and at the end the body would rebound to a level of preparedness above and beyond the level following the first training session as demonstrated in figure 1.5 below. If sufficient recovery can be achieved consistently over a long period of time the result is going to be a continually rising curve taking the athlete towards a superior level of performance as well as hopefully maintaining a healthier, fresher athlete. In contrast, if the recovery period between training sessions is insufficient the results are much more detrimental to the athlete. If the next training session is applied before the athlete’s energy stores have returned to baseline then supercompensation is never achieved resulting in greater levels of fatigue and further reductions in the athlete’s readiness to train and perform. If this trend continues in the long term the athlete’s physical development will be hampered and their level of performance will be decreased as there are increasing levels of fatigue and less energy available to the athlete. In the long term this is the scenario that will lead to overtraining putting the athlete at risk of developing the symptoms described above. Finally if training sessions are not completed frequently enough (i.e. too long between sessions) we will lose the supercompensation effect and there will be no noticeable gains from the training being completed as demonstrated in figure 1.7 below. The result again being limited or no development in the athlete’s physical capabilities or performance. Recovery should be planned in to the overall training programme and should involve not only recovery days but planned training weeks of a lower intensity and/or volume of work to maximise recovery and adaptation to the training. The table below identifies a very basic 4 week training cycle involving 1 planned recovery week every 4 weeks. Ensure that athletes have 1-2 days per week of ‘recovery’ which may consist of active rest, a recovery session or a very low volume training session. A good use of recovery days is to focus on maintaining or developing flexibility with stretches focused upon areas of the body that have been used heavily within the weekly training or areas that are known to have a limited range of movement (e.g. tight hamstrings, hip flexors). Light prehabilitation exercises addressing any weaker areas & specifically looking to prevent common injuries in the given sport would also represent a good use of this time. Continual monitoring of the athletes physical state and the training that they are doing will help avoid overtraining and further their development as an athlete. How we can monitor the athletes will be a topic for discussion in a future article. Please feel free to comment and question my views on this subject.